Consider a high-speed bus colliding head-on with an innocent bug. The force of impact splatters the unfortunate bug over the windshield. 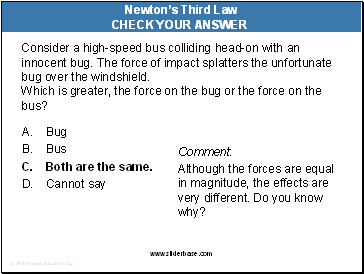 Which is greater, the force on the bug or the force on the bus? Although the forces are equal in magnitude, the effects are very different. Do you know why? 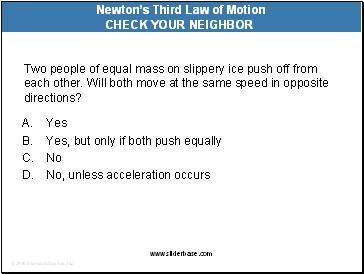 Two people of equal mass on slippery ice push off from each other. Will both move at the same speed in opposite directions? 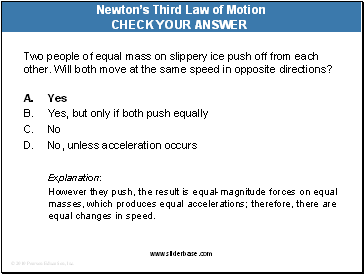 However they push, the result is equal-magnitude forces on equal masses, which produces equal accelerations; therefore, there are equal changes in speed. 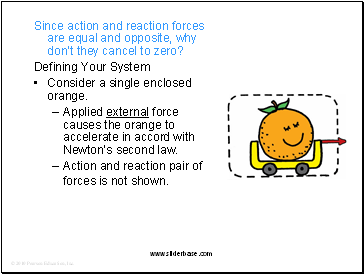 Since action and reaction forces are equal and opposite, why don’t they cancel to zero? Consider a single enclosed orange. 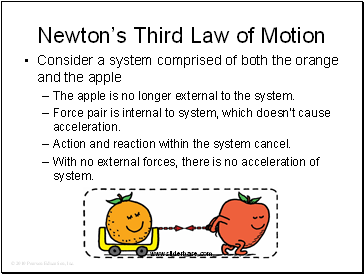 Applied external force causes the orange to accelerate in accord with Newton’s second law. Action and reaction pair of forces is not shown. Consider the orange and the apple pulling on it. Action and reaction do not cancel (because they act on different things). 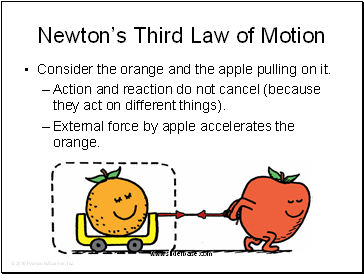 External force by apple accelerates the orange. The apple is no longer external to the system. 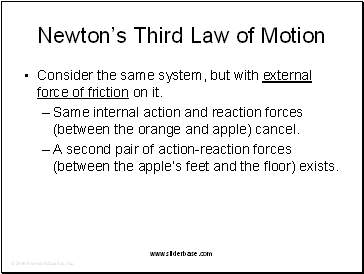 Force pair is internal to system, which doesn’t cause acceleration. Action and reaction within the system cancel. With no external forces, there is no acceleration of system.